This soup is so yummy it’s hard not to eat the entire pot. Low calorie, packed with nutrients. (optional) 2 Tbsp nutritional yeast. Getting the stock ready. Add the veggie stock, canned tomatoes and all the spices. Heat on high while you prepare the acorn squash & carrots. If you do not have Sage you can replace with Thyme. 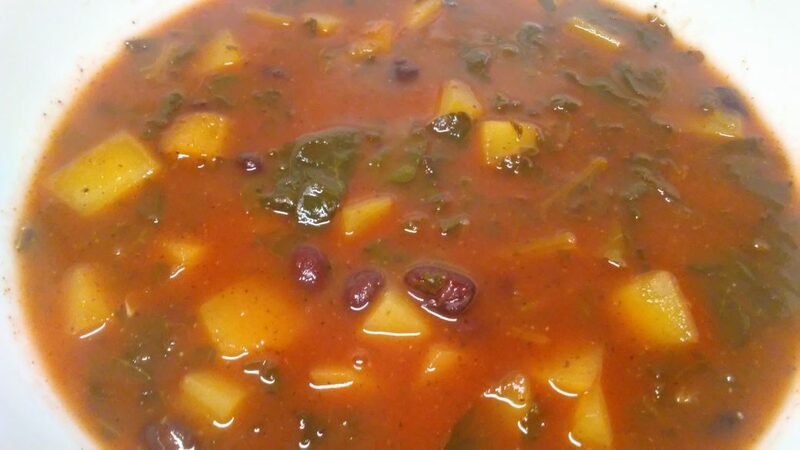 If you replace the spices with Italian herbs, the flavor will change more to an Italian sweet minestrone. I enjoy both but if you have the sage try it this way. Cut the bottom & top off your acorn squash and sit it upright on a cutting board. Using a sharp knife, cut the skin off in an arc-like motion. Like you would cut the skin off a grapefruit or large orange. Then cut it in half and use a large spoon to scoop out the seeds. Lay each half flat and cut into 1/2″ slices. Once sliced cut the strips into ½” cubes. Cut the carrots into ¼ “ – ½ ” cubes. Once the acorn squash and the carrots are cut your stock should be boiling. Add the squash, carrots & spinach to the boiling stock and reduce to a simmer. (do not add the beans) They will be added last just before serving. Let everything simmer for about 12 mins. You will notice the stock will thicken as the starches from the squash are released. This will give the soup a deep, rich almost chowder-like consistency. Then add the beans and it will be ready to serve. This will make 4 large portions or 6 small-medium portions.